Born and raised on a hop farm in Kent, Greg Tassell trained as a chorister at Durham Cathedral, choral scholar at Exeter Cathedral and as a postgraduate at the Royal Academy of Music under Ryland Davies and David Lowe. 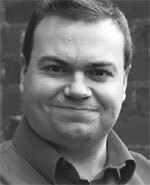 He now learns with tenor Dominic Natoli and lives in and works around London. He teaches singing privately and at Ibstock Place School in Roehampton, not far from Vauxhall. He is in huge demand around the UK for oratorio with regional choral societies and recital appearances with piano, guitar and organ. He is a popular evangelist in the Bach St John & St Matthew passions and his turn as the Dying Swan in Orff’s Carmina Burana complete with white suit and feathers is a crowd pleaser. Greg has previously worked with London Early Opera in Bach’s Christmas Oratorio and in recitals at the London Handel Festival and the Handel House Museum.